I am not a plan ahead girl by nature. I resist anything that has boxes, list or deadlines. Structure? Is not my jam. But, what I’ve come to understand is that planning ahead has so many benefits. It was something I knew I had to incorporate into my real life. People around me would call me a planner, but I know my secret identity: the kid who did her homework on the way to school. Spontaneity is great for going to the movies or taking a walk, but most good, healthy or fun stuff needs to be planned for. In this article, we’ll be talking about planning for the month ahead and what you need to do to make the most out of your planning time. means less crises in your day. means you get to include more people that you love. So, how do you actually plan ahead for a whole month? Here are a few key things to focus on as you learn to become a plan ahead person. One day a month is my “Plan Ahead” Day for our personal “stuff.” Yes– I take a big portion (maybe two hours) and plan ahead. But here’s the thing: On my Plan Ahead day in June, I’m not looking at June – I’m looking at July, and maybe some of August and September. What are our work/school schedules? What events do we have coming up? Do I need to do anything in advance for them? Do any travel plans need to be made? Are there any appointments that need to be made? Go away for a weekend? Meal planning a month out may seem crazy, but since I’ve started planning meals a month in advance, we’ve saved time, money and trips to the grocery store. Yes, plans change, but boy, knowing what we want to cook saves me a whole lot of time and trauma. What is involved in meal planning? Next month I will be sharing my strategy for how to plan ahead for the coming week. If you’re not subscribed to the blog, do it now so you won’t miss that article. Do you have any plan ahead tips? If so, share them in the comments below. If we use one of your ideas we will send you a copy of The Cure for the Perfect Life! Would you join me in a moment of silence for all the Tupperware containers lost due to my neglect? First stranded in my vehicle for weeks, then tossed to their dumpster deaths? Sometimes I think my Camry is more like a scrapbook than a car. If given the chance to ride shot-gun amongst my leftover lunches, you may notice the floorboards are littered with last week’s junk mail, sermon flyers from at least four Sundays back, and straw paper memories of the last several early morning fast food breakfast meals I’ve consumed (Chicken-Minis anyone?). Make your way to the backseats, and you’ll find a baker’s dozen of half-consumed water bottles, about a week’s worth of wardrobe, and enough old receipts to save a rain forest. I don’t even have children. I can only guess what goodies they would add to my collection! I remember being 16 and thinking I’d never trash my beloved ride to freedom. Life, it turns out, is messy. And you might be in the lane next to me, surrounded by your own junky memorabilia. I actually don’t mind cleaning my vehicle all that much. But getting myself to actually do it? That is the problem. I’ve got every excuse for procrastinating this job. My biggest being that the temperature outside is too uncomfortable. (I live in Indiana … so the hot is hot and the cold is COLD!) My next excuse, I honestly forget until the next morning when candy wrappers spill out when opening my door. I recently found a system that works for me. I still use the floorboards as my personal dumpster (we’re breaking one habit at a time here, okay?). I no longer have trouble making myself clean out my car. When you leave for work in the morning, take two plastic grocery sacks to the vehicle with you. Go about your day and make as many messes as you like. Fill one plastic sack with trash. Fill the other with items that need to go inside. On your way inside throw the trash in the trashcan. I like this system so much that I’ve started to leave a supply of sacks in my car to tidy up whenever I feel inspired. One Small Win: If you tired of putting off the task of cleaning your car, gather up some grocery sacks right now and put them by your car keys. Next time you leave, equip yourself for the job with no excuses. Just think of all the Tupperware we can save! Kelsee Keitel is a graduate student and blogger, living in Indianapolis, IN, with her newlywed husband. She is passionate about cultivating sisterhood through vulnerability and introducing young women to the freedom and abundance of life in following Christ. When Kelsee is not snuggled up with a book and sipping tea, she can be found experimenting in the kitchen or chatting with her mom. You can read more about how Kelsee experiences divine moments in the midst of ordinary life over at kelseekeitel.com or on Instagram and Facebook. 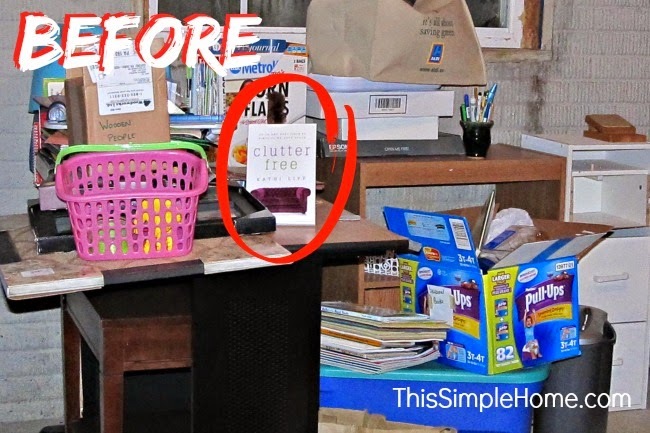 I was thrilled to join Kathi’s launch team for Clutter Free: Quick and Easy Steps to Simplifying Your Space. I frequently blog about cleaning and organizing. (My blog is even named This Simple Home. Unfortunately, simple living is more of a goal than our current status.) I have a much deeper problem of STUFF. 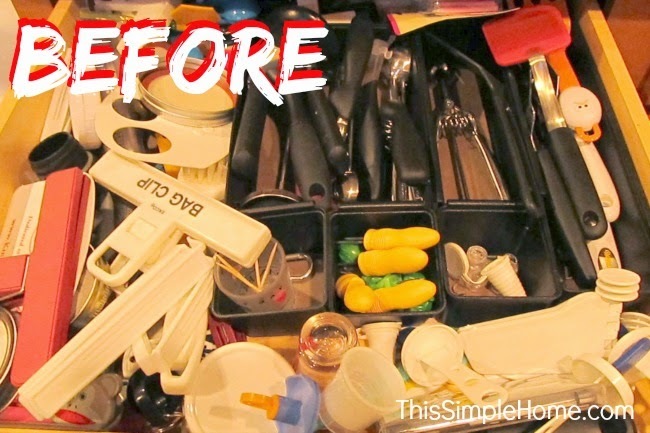 With a home overwhelmed with stuff, cleaning and organizing are futile. Kathi doesn’t just challenge and motivate us to remove the clutter from our home, she asks us to examine ourselves to get the heart of the matter of why we bring more into our homes so it can stop. I’ve read a number of articles and books about cleaning and organizing, but Clutter Free is the first to focus upon my problem of clutter. In addition to the typical, “Do I use it? 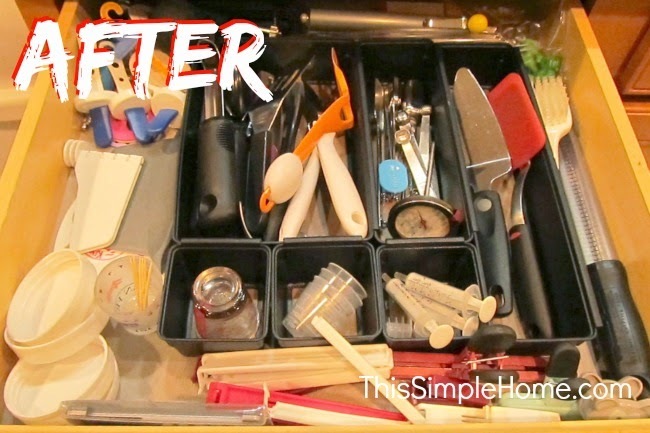 Do I love it?” questions, Kathi has added an all-important question to ask myself: “Would I buy it again?” Whether I am going through my kitchen gadgets, my children’s clothing, or my office supplies this question is key for me. In about twenty minutes, I cleaned out my kitchen gadget drawer. Using Kathi’s three-box and two-bag system, I found 18 items to donate, 14 to trash, and 20 which needed a new home. That’s 52 items which didn’t deserve to be in one drawer! Next, I took my boxes and bags to the basement. The whole basement is a problem area (linked to additional photos of my reality). As Kathi suggested, I chose a smaller area to work and filled my boxes and bags. That’s right. The cheap, white piece of furniture is missing a drawer front. Don’t worry…it’s empty. Just sitting there taking up space in the basement. It makes perfect sense, right?Yet, before long, I made some excellent progress. This is the new area. As I work to clean the entire basement, I’m sure this desk will be a bit of a work space. After that, we’ll reevaluate its usefulness. I set the crate of children’s books in that convenient spot so I can fill it with even more book to remove from our home. The shelf has the craft items on it. This past summer we set up the shelf and purchased the plastic shoeboxes. Before that, all of that shelved items were on, under, and around the desk area. Though I haven’t labeled the plastic boxes yet, I can now find what I need. My husband typically holds onto even more stuff than me. He may not be as enthusiastic as me, but he has surprised me at just how much he is helping by saying we can donate items we’ve been holding onto for far too long…just in case we need them. (Obviously, I related well to the chapter titled “Just in Case.”) I think we both needed Kathi’s 2,000 item clutter challenge. 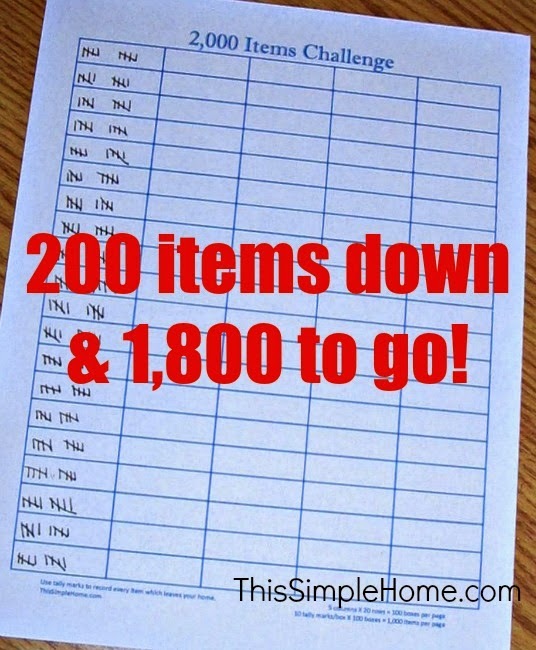 Within about a week’s time, I have collected 200 items to remove from my home. (I’m keeping track on a 2,000 item printable I created. I even made a separate one for my children.) It’s invigorating. 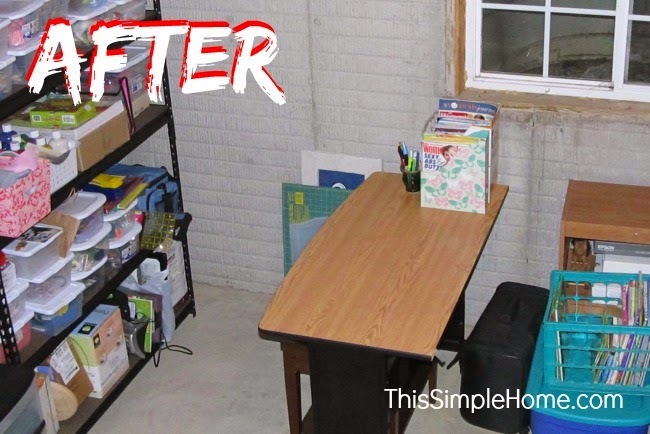 Thank you, Kathi, for writing Clutter Free. It has truly inspired me. I can’t wait to pass it on (to keep my clutter minimal) to another who is ready to make some big changes in her life.